The Secret Service has allocated more than $90,000 for golf cart rentals in South Florida this winter, ostensibly to protect president Donald Trump while he hits the links. According to federal spending data, the agency is set to pay a Delray Beach company as much as $92,740 between now and June for an unspecified number of “golf cars.” The firm supplying the carts, Maddox Joines Inc., does business as “Sunshine Golf Car” and is a straight 24-mile shot down the turnpike from Trump International Golf Club in West Palm Beach. So far, the company has received $32,225 of the potential total. How many other, similar contracts have been issued to rent golf carts for the Secret Service at other Trump properties is unknown. In September, TMZ reported that golf cart rentals at Trump’s U.S. clubs have so far cost taxpayers $300,675. When and if the latest contract is fully paid out, it will bring Trump’s golf cart rental expenses up to nearly $400,000 since he took office—an apparent modern record in such a short period of time, based on past presidential expenditures. 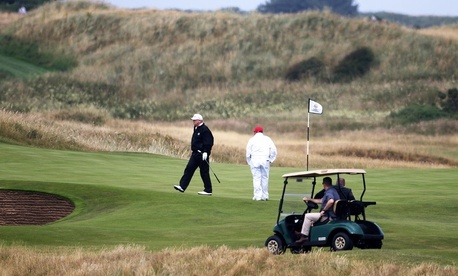 Several Secret Service agents follow Trump in the carts every time he plays golf—which as president he has reportedly done 154 times, or more than 20% of the days since he took office. As Quartz recently noted, all golf carts used by Trump’s security detail must be modified to go at least 19 mph, which is about 5 mph faster than a standard cart. Trump’s total golf expenses—including the cost of his Secret Service detail—currently stand at an estimated $77 million. Per TrumpGolfCount.com, the president played his most recent round on Sunday, Nov. 25, at Trump International. The website said Trump spent a little over five hours on the course with Chris Ruddy, the CEO of conservative media outlet Newsmax, and National Security Council chief of staff Fred Fleitz, who co-authored a 2015 paper which suggested revoking the citizenship of American Muslims who followed Islamic law.